Awoken icons is reached on 2.3 version, It is most popular icons for linux, You can install these Awoken Icons on Ubuntu 12.04 Precise Pangolin/Ubuntu 11.10 Oneiric Ocelot/Ubuntu 11.04 Natty/10.10/10.04/Linux Mint. AWOKENWHITE ICONSET RELEASED!!! Now it's possible to choose between three different iconsets by default: AwOken, AwOkenDark, and AwOkenWhite! NEW LIBREOFFICE ICONS! They are available both in the colored and in the mono versions. Revision of the customization script: now in the act of customizing a single iconset it's possible passing arguments (thanks to getopts). This capabilities will be extended to most of the scripts in future releases. Application added (or redrawed): muon, houdini, nuke, kdenlive, PsCS5, maya, mari, search_field, ardour, media-playback-pause 22x22 (slightly smaller), mendeley, zbrush, preferences-desktop-display, category-show-all, gsd-xrandr, preferences-color, text-x-apport, libpeas-plugin, goa-panel, goa-twitter, goa-facebook, goa-google, goa-yahoo, insert-link, locationbar-erase, system-upgrade, visualization, view-refresh, orca, aptdaemon-resolve, fullscreen, no-fullscreen, view-page-continuous, view-page-facing, system-upgrade, document-edit, document-export, document-import, document-new, document-print-preview, document-page-setup, edit-copy, edit-paste, filenew, gtk-file, gtk-dnd, gtk-dnd-multiple, edit-select-all, document-preview-archive, go-previous-view-page, go-next-view-page, go-last-view-page, go-first-view-page, touchpad-disabled, edit-undo, edit-redo, document-open, tab-close, window-close, tab-open, window-open, search, search-and-replace, input-tablet, input-dialpad, mail-inbox, eog, hwbrowser, applications-arcade, category-show-all, drive-harddisk-system, fork, empty-trash, indicator-weather, get-hot-new-stuff, indicator-virtualbox, tomboy-panel, note-taking applications in smaller dimensions (22x22 px), teamviewer, beaver, emblem-shared, object-rotate-left, object-rotate-right, object-flip-horizontal, object-flip-vertical. 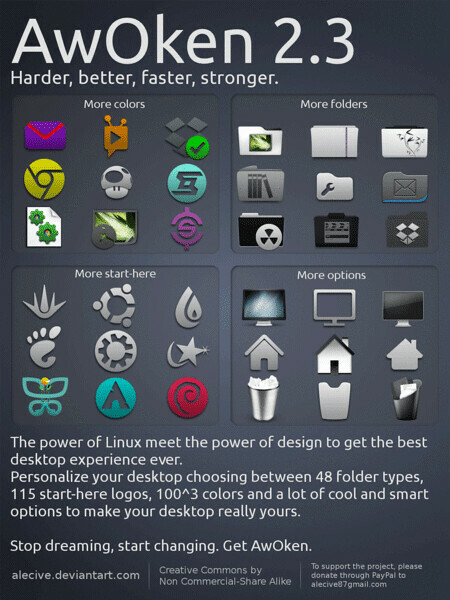 No Comment to " Install Awoken Icons 2.3 on Ubuntu or Linux Mint "